Movie Review: Matthew Heineman’s documentary, “Cartel Land”, clarifies what’s happening on the both sides of the US-Mexico border, depicting two different realities and leaving us speculating about the tenuous line between the right and wrong. The film opens with a scene set in Mexico, in which some men, cooking meth with the consent of the Mexican government, explain they’re aware of the harm they’re doing but have no choice since they’re living in poverty. The film then turns our attention to Tim 'Nailer' Foley, an American vigilante who operates by his own initiative on the American side of the border, trying to catch Mexican intruders and protect the nation. He says that his past was characterized by abuses and addiction, and 18 years ago, and for the sake of his daughters, he resolved to hunt fiercely any cartel’s men who attempt to invade his land. On the other side of the fence, in the problematic state of Michóacan, we can follow an indominable and fearless doctor, Jose Manuel Mireles, who leads the Autodefensas, a group of vigilantes that protect the people from drug lords and thugs who belong to the most dangerous Mexican cartels. Some witnesses describe the horrors lived by the people, and the common massacres to entire families as retaliation for problems related to narcotics. Slowly, the local citizens start to be encouraged by Mireles’ illegal militia, whose members refuse to succumb at the hands of the barbarians without a fight. Conquering more municipalities than it was initially thought, the Autodefensas face a new issue, which is not exactly new in their minds: the government corruption, outspokenly denounced here by tough words, disquieting images, and perceivable examples. 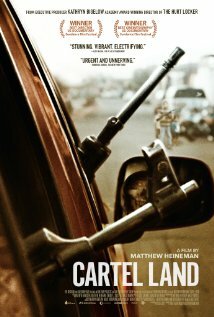 Despite Mr. Heinman’s bravery, “Cartel Land” is unorthodox in the manner it addresses and toggles between the stories. The final part even has a hint of soap opera when we learn about Mirele’s domestic troubles, caused by his tendency to have affairs with much younger women. Even momentarily heedless, the film proves to be strong when exhibits in loco the brutality and constant insecurity of the operations whose intention is to stop the terrifying actions and shameful business carried out by the merciless organized crime. Even the ones who seemed to be fighting for the right cause, like Mirele’s right hand, Estanislao Bertran Torres, show their real face and irresolution by joining the vicious government. Isn’t easier this way?